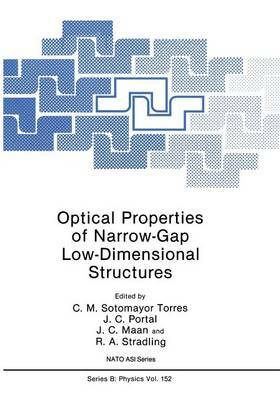 This volume contains the Proceedings of the NATO Advanced Research Workshop on "Optical Properties of Narrow-Gap Low-Dimensional Structures", held from July 29th to August 1st, 1986, in St. Andrews, Scotland, under the auspices of the NATO International Scientific Exchange Program. The workshop was not limited to optical properties of narrow-gap semiconductor structures (Part III). Sessions on, for example, the growth methods and characterization of III-V, II-VI, and IV-VI materials, discussed in Part II, were an integral part of the workshop. Considering the small masses of the carriers in narrow-gap low- dimensional structures (LOS), in Part I the enhanced band mixing and magnetic field effects are explored in the context of the envelope function approximation. Optical nonlinearities and energy relaxation phenomena applied to the well-known systems of HgCdTe and GaAs/GaAIAs, respectively, are reviewed with comments on their extension to narrow- gap LOS. The relevance of optical observations in quantum transport studies is illustrated in Part IV. A review of devices based on epitaxial narrow-gap materials defines a frame of reference for future ones based on two-dimensional narrow-gap semiconductors; in addition, an analysis of the physics of quantum well lasers provides a guide to relevant parameters for narrow-gap laser devices for the infrared (Part V). The roles and potentials of special techniques are explored in Part VI, with emphasis on hydrostatic pressure techniques, since this has a pronounced effect in small-mass, narrow-gap, non-parabolic structures.